The end of the Cold War, the “third wave” of democratization, and economic globalization have presented the newly industrialized countries of East Asia and the liberal democracies of Latin America with increasingly similar international opportunities and constraints. During the 1980s, Latin America made great strides in democratization, while East Asia led the world in economic growth. Are the two regions now converging toward a model that combines economic and political liberalization? Many developments in both regions indicate that this is a serious possibility. Although significant countertrends do exist, there is now increased scope for mutual support and encouragement among aspiring democratic forces both within and between these two regions. 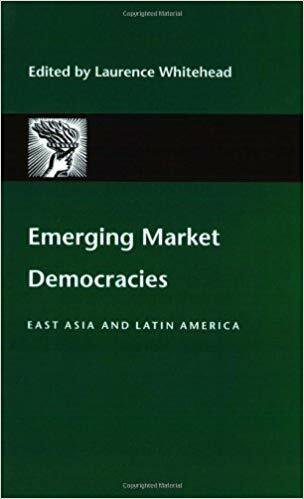 This book examines these interrelated issues, paying special attention to the effects of the East Asian financial crisis of 1997–98 and its subsequent impact on Latin America. Ananya Basu, World Bank; Francis Fukuyama, School of Advanced International Studies, Johns Hopkins University. ; Stephan Haggard, University of California-San Diego; Elizabeth M. King, World Bank; Sanjay Marwah, George Mason University; Sylvia Maxfield, Harvard University; Eduardo Silva, University of Missouri-St. Louis and University of Miami; Gordon Redding, University of Hong Kong; Tun-jen Cheng, College of William and Mary; Yun-han Chu, National Taiwan University; Laurence Whitehead, Oxford University. Laurence Whitehead is a professor at Nuffield College at Oxford University.